Pounce patterns are critical for hand lettering, gilding and mural painting. Here we see a papter pounce pattern taped to the transom of a classic wooden yacht. 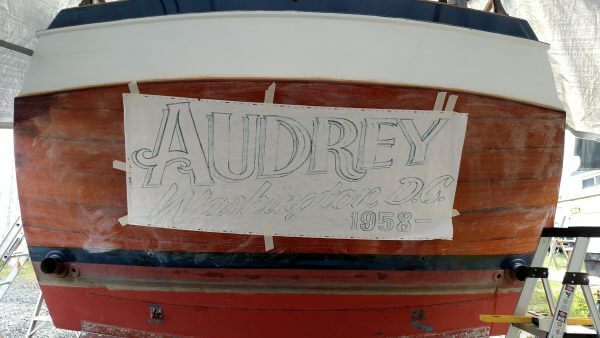 The pattern is applied to the transom with charcoal powder and then the rest of the painting and gilding is done by hand, following the charcoal lines on the transom of the yacht. Pouncing is an art technique used for transferring an image from one surface to another. It is similar to tracing, and is useful for creating copies of a sketch outline to produce finished works.A pounce wheel, also known as a tracing wheel. Pouncing has been a common technique for centuries, used to create copies of portraits and other works that would be finished as oil paintings, engravings, and so on. The most common method involves laying semi-transparent paper over the original image, then tracing along the lines of the image by creating pricked marks on the top sheet of paper. This pounced drawing made of pricked holes is laid over a new working surface. A powder such as chalk, graphite or pastel is forced through the holes to leave an outline on the working surface below, thus transferring the image. The powder is applied by being placed into a small bag of thin fabric such as cheesecloth, then dabbed onto the pricked holes of the pounced drawing. Look closely at this photon. 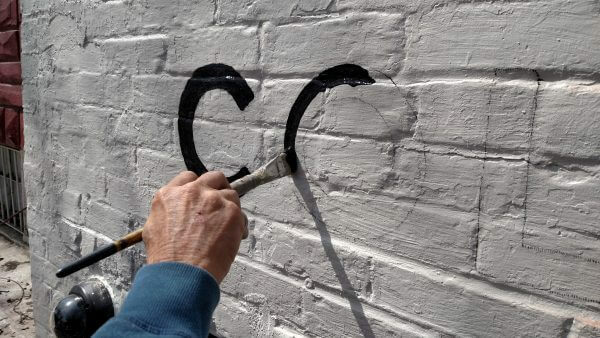 Brendon paints a letter by hand. He follows the charcoal lines on the wall which are applied with the pounce pattern. Brush lettering at Colony Club in Washington, DC.